Ladislas was king of Hungary and the second ruler of the Árpád dynasty to achieve sainthood. At the end of the 10th century the Magyar leader Géza and his son Stephen began the conversion of the pagan Magyars to Christianity and the foundation of Hungary as an independent Christian kingdom. In 1000 Pope Sylvester II crowned Stephen king of Hungary, establishing the country’s independence from the Holy Roman Empire (early). Neither Christianization nor the foundation of the state was fully complete at Stephen’s death in 1038, and the succession struggle demonstrated both the strength of pagan religious practice in the country and the vulnerability of the kingdom to foreign, particularly German, influence. In the following 40 years Hungary was subject to two pagan uprisings and nine invasions from Germany, Bohemia, and Poland. The crown changed hands eight times and between 1044 and 1046 the kingdom was ruled directly by Henry III as a fief of the empire. 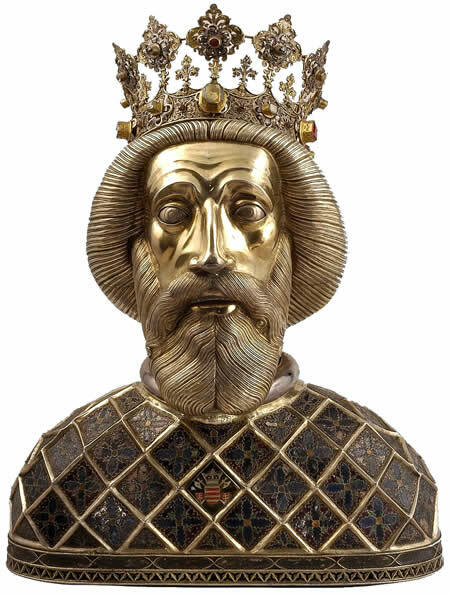 Ladislas (Hungarian, László) assumed power in 1077 following the death of his uncle, Géza I, but only secured his rule by defeating the deposed King Salamon and his Cuman allies in 1083. Ladislas pursued policies that strengthened the Christian Church, increased the kingdom’s independence from German influence, and extended its power in southeastern Europe. In the investiture struggle between Pope Gregory VII and Emperor Henry IV, Ladislas supported the pope and his German allies. As part of the anti-imperial alliance he married Adelaide, the daughter of Duke Welf of Bavaria. Henry IV’s continued troubles allowed Ladislas to extend his control over southern Hungary, Transylvania, and Croatia. In a series of campaigns along the lower Danube he defeated the Pechenegs and their allies among the remaining pagan Magyars. In Transylvania, he established the fortress of Gyulafehérvár (Alba Iulia) and settled Magyar-speaking Szekler tribesmen in the southeastern corner of the country, giving them communal rights in exchange for military service as frontiersmen. After the death of his brother-in-law King Zvonimir of Croatia, Ladislas occupied Slavonia and incorporated it into the kingdom of Hungary, establishing four new counties between the Drava and Sava rivers. To consolidate the church and complete the process of converting the Magyars and other inhabitants of the kingdom to Christianity, Ladislas founded new bishoprics in Nagyvárad (Oradea) and Zagreb. It was in Ladislas’s reign that Hungary’s first king, Stephen I, and his son Imre were sainted. The earliest Hungarian chronicle, the Gesta Hungaracorum, which recounted the early history of the Magyars and their conquest of the country, was composed at his court. In 1095 Ladislas died while preparing to join the First Crusade. Soon after the first miracles associated with him were reported. For these and his contribution to completing the Christianization of Hungary he was canonized in 1191. A number of legends surround the life and deeds of Ladislas, many of them clearly adaptations or repetitions of older pagan Magyar myths, retold with a Christian hero. After St. Stephen, Ladislas made the most significant contribution to the foundation of the kingdom of Hungary and its conversion to Latin Christianity.